To be self-sufficient a person using any knife should know how to keep his tool sharp. It is actually more involving than it appears and some people can not sharpen their tools while some other can do it extremely well. This blog gives an explanation to all this mystery. 1. Knowing the original capability of the tool. The makers of tools usually know quite well how to bring out the best capabilities of their tools, a user can rarely bring any tool to a better state than provided by its maker when new. For this reason it would be futile for the owner of a kitchen knife to attempt to make it as sharp as an expensive razor blade. If it can be done, the maker of the knife would have done it to advertise his products. 2. The material of a knife determines its practical sharpness. 2a- The sharpness of a knife depends on its materials. The materials of the knife blades are mostly metals. Any metal is made up of grains which adhere together firmly and closely. Atoms inside each grain arrange themselves into geometric pattern fitting the chemical bond configuration of the metal. The arrangement of atoms in each grain determines all (including physical) properties of that grain (For example, in one arrangement each atom may have twelve closest neighboring atoms while in another arrangement each may have only eight neighbors.). The bond configuration depends on and may even change drastically with the introduction of foreign (solute) atoms into the host (solvent) atoms of the grains. The change from one arrangement into another of atoms in a grain is called a phase transformation by metallurgists. When metal solidifies multitude of crystallization centers form simultaneously and they are randomly oriented. Each crystallization center gives rise to one grain. The boundary of each grain is where its orientation is terminated by meeting different orientations from neighbor grains. 2b- If the grains cannot be shaped, cut and cannot adhere together to hold the shape of a thin edge then no thin knife edge can be formed. If the grains of a knife blade deform, crack easily or don’t adhere together there is no way of making a sharp edge for the knife. The boundaries between grains in a metal are the weak points of that metal. Cracks in a metal usually develop and propagate along grain boundaries. Corrosion also begins at grain boundaries. 2c- Any knife blade made of a single grain would be stronger and more corrosion resistant but it is uneconomical to make such knives from single large grains. 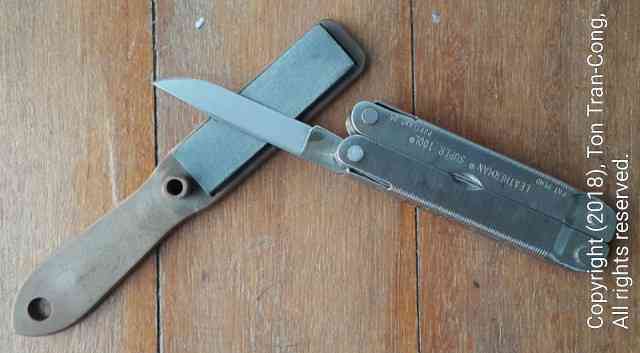 Practical knife blades are made of metal with multitude of randomly oriented tiny grains. Finer grains give blades with better resistance to cracking. 2d- If the grains of a knife edge are heterogeneous then the blade can crack easily: Cast iron has heterogeneous grains and it is very hard to make any good cutting edge out of cast iron. 2e- When tougher grains of steel are gouged by the sharp particles of a grinding wheel their debris fly off at higher speeds. For this reason, high strength carbon steels give off the longest sparks when ground by a grinding wheel while mild steel and cast iron give off shorter sparks. For carbon steels knives it can be said that only blades that give off long sparks can make sharp knives (This observation does not apply to stainless steel knives as stainless steel debris don’t burn in air to make sparks). 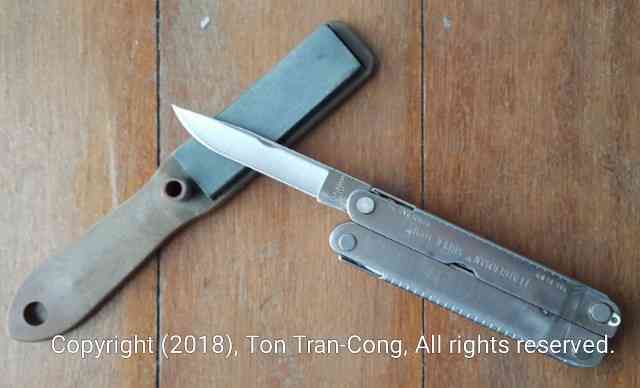 2f- If the grains are flattened in the same plane as the knife edge then they can adhere together better: Forged knives hold their sharpness better than non-forged knives. 3. Application to the proper usage and care of knives. Do not leave sharp kitchen knives made of high-carbon steel wet. Corrosion by water can damage it overnight resulting in the cutting edge being serrated. 4. Sharpening of a knife edge. 4a- Preserve the original shapes angles of the knives. The angles of the sharp edges have been chosen by the knife makers to give optimal sharpness and durability: Thin razor blades are sharp but are not impact resistant, thick axe blades are not that sharp but are impact resistant. 4b- When sharpening a knife blade, the grains of the sharpening stone should be finer than the required thin edge of the blade. 4c- All carbon and alloy steel tools can be ground and sharpened by Aluminum oxide sharpening stones. 4d- Quality alloy steel items (made of “tool steel” having higher hardness and can be used to cut other types of steel) such as “high speed steel” drill bits and lathe cutting bits should be sharpened by “silicon carbide” sharpening stones. Applying higher pressure between a silicon carbide stone and the steel does not make the grinding any faster but make the binding matrix of the stone break and wear down the stone. Therefore suitable (matching) type of grinding stones should be used for each type of steel. Any flat back of a hard ceramic tile. Any piece of abrasive paper wrapped around a firm flat surface. 4g- A liquid lubricant helps removing metal and stone debris from the grinding location and keep the grinding points cool. This makes faster grinding. Kerosene or light machine oil can be used as grinding, sharpening lubricant on proper sharpening stones. Using water as lubricant may cause corrosion on some types of steel. 4h. When sharpening the cutting edge of a knife by rubbing it against a stone that edge should be trailing behind the knife and kept at right angle to the direction of motion (the direction of the grinding stroke). Tiny grooves made at right angle to the cutting edge by this method of sharpening may serve as serration and may make the knife cut better. Rubbing a block of cheese against a cheese grafter would give you some visualization of the effect of grinding steel grains against a sharpening stone. Figure: Direction of grinding: The blade is rubbed against the sharpening stone by pulling it towards the user with his right hand; the small aluminium oxide sharpening stone is mounted on a flat plastic bar which is held by his left hand. Figure: Direction of grinding: The blade is rubbed against the sharpening stone by pushing it away from the user with his right hand; the small aluminium oxide sharpening stone is mounted on a flat plastic bar which is held by his left hand. 4i. Pulling lengthwise the thin cutting edge of a sharp knife against a grinding stone will make it lose its shape and may destroy its toughness. Pulling lengthwise is only acceptable for axes and chopping knives with thick blades. Pulling lengthwise against a sharpening stone may leave lengthwise grooves and lines of residual stress which may curl a thin blade. 4j. Circular grinding motion may be a compromise motion for sharpening a long knife blade. 4k. Sharpening by a powered grinding wheel may bring the steel of the knife blade to too high a temperature and may change its material as well as creating residual stresses in it. High speed steel is again the exception. Sharpening a thin knife is not hard and is a satisfying experience when adhering to all the above instructions. 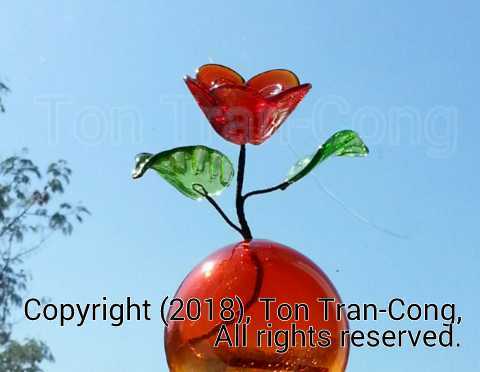 So it is worthwhile to inform people this little-known fact that some types of beautiful color glass do fade under sunlight while some other do not. 1. Some types of color glass fade under sunlight. 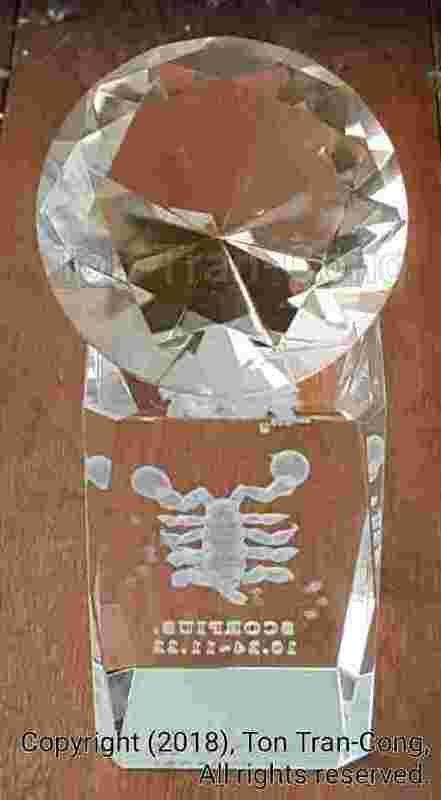 Figure: A diamond shaped glass object placed on top of a prism of colorless clear glass. The diamond shaped object is now almost colorless and retains only a faint taint of its former deep orange color. Some diamond shaped decorative glass objects of red, yellow, pink colors have not faded while similar objects (bought from the same shop at the same price) of orange, green colors have faded significantly. The fading is in the bulk of the color glass, not in its surface coating (None of my glass items had any color coating). To know why the colors fade we have to know why some types of glass have colors. 2. Why do some types of glass have colors ? Glass makers mix compounds of transitional metals into clear glass to give it colors. The atoms of transitional metals have many unfilled outermost shells of electrons. Electrons can jump between those unfiĺled outermost shells absorbing or emitting light with the exact visible wavelengths corresponding to the differences between discrete energy levels of the shells (Those atoms act like resonating antennas placed in the beam of incoming electromagnetic waves having those wavelengths.). The energy levels between unfilled shells and the number of electrons in those shells of the transitional elements change with the electronic configuration of their atoms. That is why a single transitional element may have different colors in its different compounds. 3. Practical effects of change of colors in the bulk of glass. Figure: Colorful object of glass art such as this should be kept away from sunlight when its fade resistance has not been ascertained. Effectively, some change in the bonding of transition metal atoms with its surrounding atoms is enough to change the color of the glass. Heat, sunlight and irradiation can all cause this change. Some dishonest antique collectors subjected their antique glass items to irradiation to change their colors. The items are then sold on at higher prices as antique items with rare colors. ” Fakers and forgers are now using a new method to alter the color of antique and collectible glassware. It is called irradiation. … irradiation changes glass internally within the very atoms of the glass .” This precaution also applies to gemstones . Prized glass items of beautiful colors are usually made by reputable glass makers from non-fading glass. Similarly gemstones are appreciated because theirs color are non-fading. Stained glass windows should be made from only time-proven non-fading types of glass as sunlight may bleach any untested new type of color glass. It is little -known but sunlight and irradiation can change (bleach or deepen) the colors of many glass items. Consequently only glass and gemstone items of proven non-fading types be displayed under sunlight. As sunlight can bleach many types of color glass, stained glass windows should be made from only time-proven non-fading types of glass. 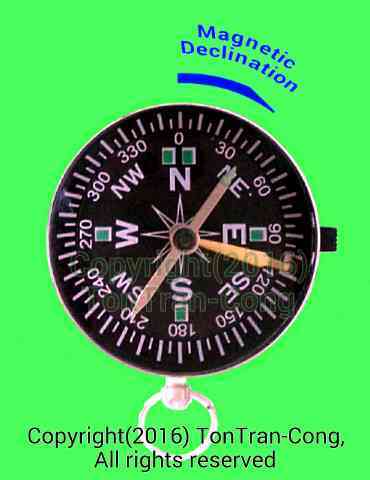 Indian mariners had first use of magnetic navigational compasses. The magnetic navigational compasses may have been first used by Indian people and may not have been first invented by Chinese people as often claimed. 1. Claims that China invented the compasses. So the compasses are used in China after 206 BC, but it was initially only for geomancy. So the written records on the use of compasses for navigation in China are made after year 960 CE. 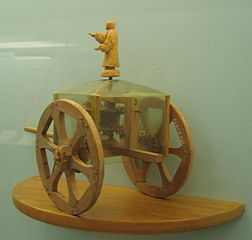 Note that there were South-pointing chariots used in ancient China before year 235 CE [2b, 2c, 2d] but their operation was not based on magnetism. Their operation relied on the differential between the numbers of rotations of the left and right wheels (of same size) of each chariot to give its total yawing angle since departure. Those chariots may have even been “first constructed by the Duke of Zhou (beginning of the 1st millennium BC) as a means of conducting homewards certain envoys who had arrived from a great distance beyond the frontiers.” [2b]. by Author Andy Dingley, licensed under the Creative Commons Attribution 3.0 Unported license. 2. Appropriate places to look for records. Many people look for easily read records. China certainly has many records which have been translated into English and are easily understood by readers in the World. However, China is a land conquering empire, requiring little use of compasses while India is a sea faring trading empire which may benefit a lot from compasses. The logical place to look for records of first use of navigational compasses should therefore be India, an outreaching seafaring trading empire (as necessity is the mother of inventions). Indian influence is obvious over the vast area of Indian Ocean, Polynesian nations and (mostly South) Pacific Ocean [2e]. Any discovery of earlier use of magnetic navigational compass predating Chinese use should not surprise/disappoint investigators as the people of the trading Olmec nation (on the side of the Gulf of Mexico) has even used lodestones, hematite, magnetite since 1500 BC, one thousand year before any record of Chinese first use of lodestones , . It is to be noted that China is on the East of India while Arab countries, Spain, Olmec are spread to its West. 3. Many evidences pointing to ancient use of compasses by Indian people . The literature of the out reaching, sea faring nation India have many evidence to support its first use of the magnetic navigation compass. However, no evidence have been given in  to support the claim of “around 1800 BC”. 4. Evidence on knowledge of magnetic attraction by Indian people since 500BC. In Vedas, there is reference to “ayas” implying Iron and “Akarshan” attaction, thus, pointing to Iron-magnet relationship. The date of 500 BCE assigned for Kalidasa quoted by  may be in error. Wikipedia  stated that Kalidasa’s works cannot be dated with precision, but they were most likely authored within the 4th-5th century CE. In any event, it is not important, only the date of 550BCE assigned to Kanada is pivotal to the thesis of this article. 5. Evidence on compass use by Indian people since 500CE. “Milindapanho (VII.2.16) composed during 4th-5th centuries CE, mentions about an instrument used by the pilot of a ship for steering the ship. “And again, O King, as the pilot put a seal on the steering apparatus, lest any one should touch it”. Rhys Davis translates the term as “steering apparatus” and it Sanskrit it is “yantra”, a mechanical devise, just like “matsya yantra” working on mechanical and accompanied with other principles. Mookerji points out a compass on one of the ships in which Hindus of the early Christian era sailed out to colonize Java and other islands in the Indian ocean. The Hindu compass was an iron fish (called in Sanskrit matsya-yantra or fish machine). It floated in a vessel of oil and point to the north (History of Indian Shipping, London, 1912) . The following is what Mr. J.L. Reid, who was a member of the Institute of Naval Architects and Shipbuilders in England, has said in the Bombay Gazetteer, vol. xiii., Part ii., Appendix A. The thesis of this article is Indian mariners have already used magnetic navigation compass at least since 500 CE while Chinese had recorded usage of them only after 900 CE, a long four hundred years later. It appears that the out reaching Indian seafarers had the first use of magnetic navigational compasses. Since necessity is the mother of inventions, it is natural to expect this as India had been an ancient seafaring trading nation. [2b]. Needham, Joseph (1986). Science and Civilization in China: Volume 4, Part 2. Taipei: Caves Books, Ltd., pages 286, 289, 291, 298. A guide to some hard to obtain knowledge. These are the contents of HOW TO sub-page re-organized in book order for coherent reading. Was New Year night chosen to have Sirius highest at midnight? These are the contents of this site re-organized in book order for coherent reading. Copy of the heading of SITE. Select your chosen category of topics by clicking one of the above buttons or read all by clicking one of the following buttons. Furthermore, each beam is highly directional, with a wave length of only 300÷200,000 = 1.5mm. The ears of the victim is the non-linear medium producing the beat frequency right inside the ears of the victim. Earmuffs equipped with ultrasound sound meters may be effective. Alarm: Using AMP may kill your website. Google Search engine offers an Accelerated Mobile Project. However, if you enable that AMP feature for your site, your traffic will be diverted to the cached site of AMP, the menu bar of your WordPress site is not displayed and your site loses any traffic diverted to AMP cache site. 1. The damages caused to your site. AMP diverts your visitors to its own site. There is only a tiny chain link with tiny characters for them to click on to see your original site. Although the numbers of site visitors may (or may not?) be credited to your original site, pictures and figures from your original site may not receive their due numbers of traffic and clicks. This will degrade the rating of your site and make it loses any potential. 2. Restoring your WordPress site settings. You have to go to Web Admin site to manually nodify the settings of each of your blogs. It is labor intensive to undo the terrible setting. 1. Log in to WordPress.com on a Desk Computer. 3. Click on VIEW ADMIN. 5. Click on your POSTS to list all your blogs. 6. Click on EDIT next to your selected individual blog post. 7. On the right hand side column of the new editing screen, search for Publish/AMP.If AMP has already been Disabled, you don’t need to Edit it. Click EDIT next to the box Enabled to reveal the box Disabled for AMP. 8. Click on the box DISABLED for AMP. 9. Click OK button near to AMP to confirm that it is to be disabled. 10. Click UPDATE and wait for the blog post to be updated and see that AMP is now Disabled. 11. The selected blog post has been AMP Disabled, you may now click on the back arrow on the top left of the screen to see all your POSTINGS to modify the next post. This is a laborious process to get out of a traffic starvation trap. You have lost the ratings of your figures and components in the blog posts. As usual, there is no free meal. Do not participate in anything offered if you don’t know it fully.
. Just do a Google search on “AMP steals traffic” and see the results. Authentic Noodle Soup with Pork Ribs or Barbecue Pork (Mì Sườn Heo hay Xá Xíu Chánh Gốc). We are lucky to learn from Mr. Mach Van Cuong an AUTHENTIC recipes for making Noodle Soup with Pork Ribs (Mì Sườn Heo) and Noodle Soup with Barbecue Pork (Mì Thịt Heo Xá Xíu). Mr Cuong is a food connoisseur who wants to preserve and disseminate Oriental knowledge. Oriental recipes have usually been closely guarded as family secrets. 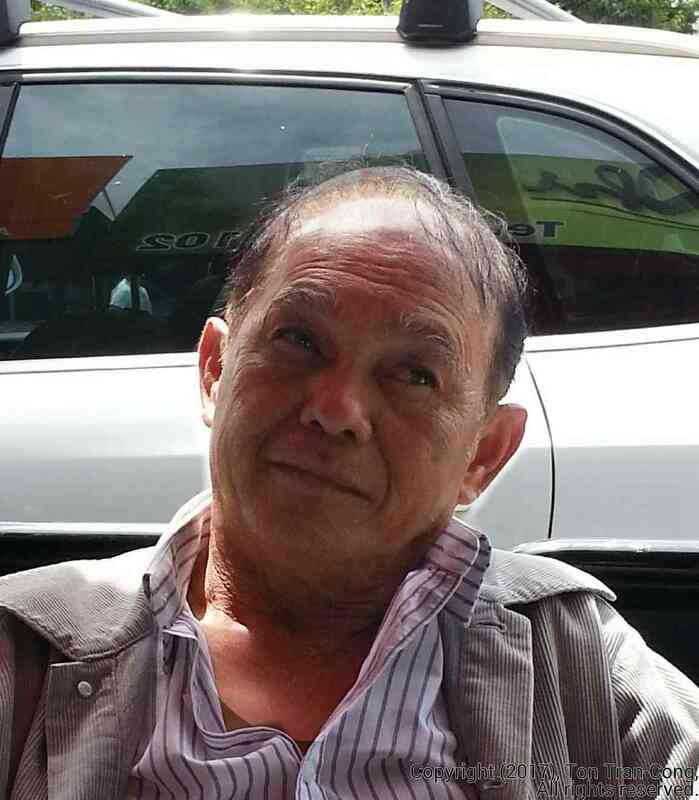 Mr Cuong had been working for his parents’ business in various types of activities (importing and exporting of electronic parts, jewelers tools, and herbal food supplies). He enjoys applying traditional herbal knowledge. Figure: Mr Mach Van Cuong who teaches the Authentic Recipes presented here . Noodle Soup with Pork Ribs or Barbecue Pork (Mì Sườn Heo hay Xá Xíu Chánh Gốc) originated from Cantonese recipes. Either of them is a delicious, tasty, nutritious, non-odored dish and is well liked in Saigon. They are basic ordinary noodle soup dishes from which many variations such as Noodle Soup with egg pasta Wrapped Minced Prawns (Mi Xui Cao), Noodle Soup with Prawns and Pork (Mì Tôm Thịt), Noodle Soup with Sea Food (Mì Đồ Biẻn) are built upon. Non-odored dish means a dish that does not make your body have its aroma (smell) after eating. 1. Noodle soup with Pork Ribs. Figure: Noodle Soup with Barbecue Pork, (Mì Xá Xíu) in 300 ml bowl with its barbecue pork on a separate dish ss served from a Vietnamese restaurant in Australia. A cloudy broth indicates the high probability that it may have been made by a traditional method. Noodle Soup with Pork Ribs (Mì Sườn Heo), Noodle Soup with Barbecue Pork (Mì Xá Xíu Thịt Heo) and Noodle Soup with Prawns and Pork (Mì Tôm Thịt) are often served with an accompanying Fried Prawn Pancake. 1. A nutritious, healthy dish may become a harmful dish if the traditional recipies are not observed. 2. Authentic Recipes for Noodle Soup with Pork Ribs. 1. Marinate 100g of pork ribs in oyster sauce. 2. Fry the marinated pork ribs in hot oil, with added chopped green spring onion, until cooked (its outside becomes hard and brown). 4. Take the pork ribs out of the stew. After the pork ribs have been taken out, the broth is then used in the next step. 5. Make a soup broth by adding water to the broth of the previous step and bring it to boil in a big pot for more than 15 minutes with leg bones of pork, dried prawns, dried squids and a kind of dried fish for making soup supplied by Vietnamese or Chinese (Asian) grocery stores (Khô Cá Lẹp, in Vietnamese). 6. Separately boil about 200ml of water. Dip 50g of egg noodle into this boiling water for 20 seconds. The noodle is now cooked and softened. Take the noodle out of boiling water and immediately wash it with cold water to stop noodle lengths from sticking together. A restaurant cook may boil egg noodle by dipping it in the pot of boiling broth for 10 seconds using a wire ladle. 7. Cut the stewed fried pork ribs and place it on top of a bowl containing boiled egg noodle and the broth. 8. Add one or two lettuce leaves, some chopped green chives and some boiled mung bean sprouts to the bowl. 9. A (non-essential) fried prawn pancake may be added to the top of the bowl. 10. The bowl is ready to be served. Each eater may add soy sauce, red vinegar, ground pepper, sliced hot chilly to his individual bowl to suit his taste. In authentic recipes for this dish, there is no premixing of pepper or chilly to force their consumption. 11. Small amounts of usual common ingredients can be added. They include chopped green chives (Hẹ) and fried slices of spring onion (Hành Lá). 3. Noodle soup with Barbecue Pork (Mì Xá Xíu). 1. Buy 100g of barbecue pork from a Chinese “Roast Pork, Barbecue Pork, Roast Ducks” kitchen or restaurant. 2. Cut it into thin slices of 2mm (3/32 inch) thick. 3. Jump to step 5 of Authentic recipe for Noodle Soup with Pork Ribs. Additional types of Noodle Soups. Figure: Noodle soup with egg pasta wrapped minced prawns (Mì Xủi Cảo) which is similarly prepared. The ingredients in this photo reveal the recipe. Figure: So called “Noodle Soup with Prawns, and Pork”, (Mì Tôm Thịt) in 300 ml bowl with its small bowl of soup broth served from a Vietnamese restaurant in Australia. Various ingredients are simply added into the bowl. This is only partially similar to an authentic Noodle Soup with Pork. A transparent broth indicates that it may have been made by dissolving mono-sodium glutamate in water! The broth in the figure for Noodle Soup with Prawns, and Pork is too transparent. This is a sign that it may have been non-authentically prepared by simply dissolving mono-sodium glutamate in water! I found that I had suffered the MSG syndromes after eating it. Pork ribs or ready made barbecue pork. Dried fish for making soup (Khô Cá Lẹp in Vietnamese) supplied by Vietnamese and Chinese grocery stores. Green chives (Hẹ in Vietnamese) and crispy fried slices of spring onions (Hành Lá in Vietnamese). Tiny pieces of crispy fried lard. 1. Cooks using non-authentic recipes may put in a lot of monosodium glutamate to fool customers. Traditional, authentic recipes have no such modern ingredient. In the short term, mono-sodium glutamate may cause extreme headache, throat congestion, prolong thirst and swelling of your ankles and feet. Do NOT eat any non-authentic dish prepared with such ingredient. 2. Do NOT eat any dish if you suspect that it has been prepared using borax. Borax is banned as a food ingredient. Borax is mainly used as a Welding Flux (for goldsmith welding and for industrial brazing using Acetylene-Oxygen Gas Torches), in Photo-chemistry (as a Stopper Solution), in Pest Control (the mixture of Borax and Icing Sugar is an Ant Poison). Its Vietnamese name is Hàn The (Hàn=for welding, The=sour taste). 5. Where to find it. It is a common favorite dish (costing 30000VND =$2.00 US in 2017) in Vietnam (in Saigon). In Australia, it cost $12 AU. I don’t know how much it would cost in a Vietnamese restaurant outside Vietnam. It may cost you $6.00 US (?). Good approximation to solar declination by a watch face , Navigating with an AM MW radio receiver, The Scorpius constellation, Quick fire making using sunlight.,The Orion constellation, Rice as emergency food , Using GPS in off-grid situations, Identifying moderately bright navigational stars, Slide Sky-Map for displaying tropical stars,…all. Climbing onto your own roof. During a recession, the cost of periodic roof inspections may be high for you. If your house is a single-storey one and its roof is neither steep nor slippery then you may be able to climb onto it to carry out the inspections yourself. This will save you money and will also save you from scams on unnecessary repairs carried out by dishonest tradesmen. This blog shows the essential safety points in getting onto your own roof. You need shoes with non-slip soft rubber soles. 2. Secure setup of the ladder. Your climbing ladder must be securely set up. The ladder should be inclined at the slope of 4 up 1 across. Its top must rest against a firm surface, its base must be on firm ground to stop it from tipping over. The ladder may additionally need ropes tying it down at 45° to ground pegs on both sides to stop its top from sliding sideways and tipping over. The top rung of the ladder should be nearly level to the roof surface you intend to climb onto. The two rails of the ladder should be higher than the roof top so that you can hold onto them to get onto or down from the roof top. 3. Safety line from a high point of the roof. To avoid accidental falling to the ground you need a safety line tied from a high point of the roof to your body. The other end of the safety line must be tied to a higher point of the roof. A taut rope thrown across the horizontal ridge line and tied to a heavy sand bag on the ground on the other side of the roof may serve as a safety rope. To lay such a safety rope, you may need to first throw a ball of feed line across the ridge then use the so laid feed line to pull up the safety rope. 4. Safe climbing onto your roof. With the above 3 conditions satisfied, you may safely climb onto the non-steep, non-slippery roof of your single storey house. Make sure that the safety rope has little slack, is strong enough to hold twice your weight and your roof is non-steep, non-slippery, then you can climb onto it. If necessary, move on your roof with all your two hands and two feet. This will spread your weight evenly and effectively prevent slips. When you have got onto the roof, stick to the load bearing lines of your roof. The load bearing lines are along the nail lines of metal sheet roofs or along the horizontal toes lines of European terracotta tile roofs. Some roofs (such as brittle tile roofs, thin plastic roofs, glass roofs) have NO LOAD BEARING LINES AT ALL and you must have specialist equipment to safely access them. Makes good points. In my younger years, I walked rooftops of structural fire buildings, and there’s more to it. The mattress feeling under your feet. Foreign matter on the roof that can cause slipping. Sub-roof structurally compromised, and collapse under your bodyweight, and I have seen firefighters fall through more than once. There’s a lot to it.